Ctrip Additional Promo Code-Japan Hotels! 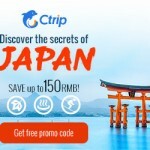 Save up to 150 RMB with Ctrip on Japan hotel hot deals! Accomplish your Christmas wish by discovering the secrets of Japan with Ctrip! Immerse yourself in a fascinating experience through the unforgettable charms of this wonderland. Enjoy now our special Promotion Code in the best Hotels, save up to 150RMB with Ctrip and feel this autumn the magical spirit of Japan! Be sure to replace !!!id!!! with your publisher ID. Eligible users: Any registered Ctrip member. Each Ctrip account may request one promotion code during the promotion period. Promo code is valid for Japan hotel bookings. Promotion code validity: 30 days from the date of issue. Eligible hotels: Promotion codes can be used for prepaid rooms showing the promotion code icon for a discount of CNY 60 for any booking exceeding CNY 1,500, CNY150 for any booking exceeding CNY 3,000. Promotion codes are only valid when paying in CNY.